The act of ‘website crypto mining‘ from people’s computers is becoming more common, with hackers hijacking computer processors to search for the cryptocurrency, the decentralized form of digital money. To avoid using extremely expensive servers, hackers are putting a script on popular websites, which infects the computers of those visiting. Recently, we also heard of a guy, who even went a step ahead and mined cryptocurrency from his Tesla Car for free. Now recently, a Starbucks store was caught mining cryptocurrency secretly using visitors’ laptops that were connected to its public WiFi network. 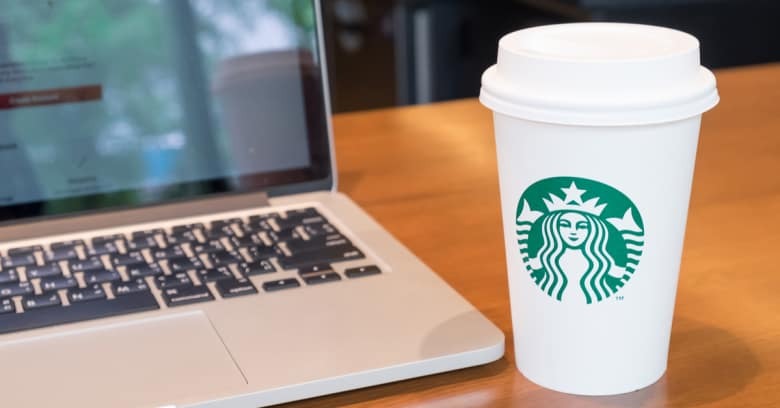 Earlier this month, when Stensul CEO Noah Dunkin tried to access the free wifi at the Starbucks store located in Buenos Aires, he noticed a strange 10-second delay his laptop took while connecting to the WiFi. To his surprise, he found a malicious code aimed at mining cryptocurrencies, had been installed on his laptop. Dinkin was quick to bring the issue to the coffee brand’s attention via Twitter where Dunking also included a screenshot of the code he found. Although Dunkin said in his tweet that Bitcoin was the digital currency being mined from his laptop, the code was actually a CoinHive script, which only works with Monero, a Motherboard report says. CoinHive’s code has been used to mine Monero by The Pirate Bay and SafeBrowse extension. About a week later, Starbucks responded to Dinkin’s tweet, acknowledging the issue and announcing that it’s been resolved. A Starbucks spokesperson told Motherboard that the issue was related to the specific store of Buenos Aires location and the problem was with the internet service provider, not with the Starbucks itself. The cyber-security experts suggest that users should always be wary when connecting to public wi-fi networks. They should ensure to use up-to-date software and be on the lookout for suspicious activity, to minimise their risks. If you notice your computer getting very slow when browsing a site, it may be a sign that they are using a browser miner. Clear your browser cache and scan your computer for threats. Coolpad Mega 2.5D Review: The Best Smartphone At A Relatively Low Price!